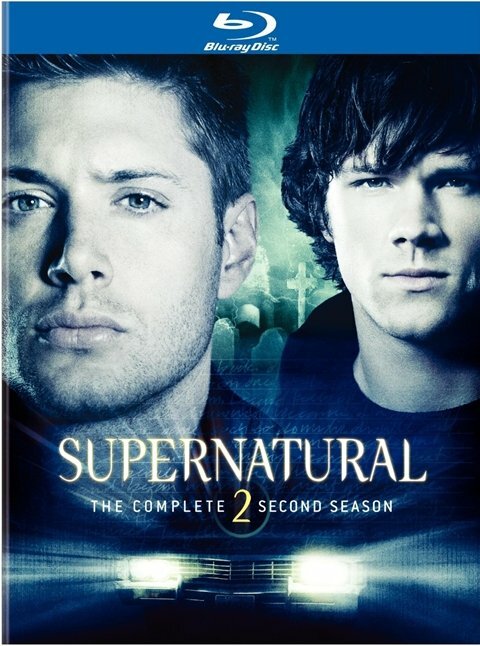 Supernatural is just old enough as a television series to have missed the boat on Blu-ray becoming the dominant force for high-definition home entertainment. That's why the third season was the first to get the Blu-ray treatment. It wasn't until 2010 that the first season was released, and now with this set, the Supernatural Blu-ray collection is complete. Like earlier editions, the time has not been wasted, as the set includes extensive additional material to make it well worth the upgrade from DVD. One of the best features of these Blu-ray sets is their interactive "Devil's Road Map." As always, this extra packs in hours of entertainment, featuring behind-the-scenes featurettes and interviews with cast and crew of each of the 22 episodes. As many of these interviews were conducted specifically for the Blu-ray set, we get a rare opportunity to hear their take on these earlier adventures from the perspective of looking back after all the kernels laid here culminated in that epic fifth season finale. While the first season was a lot of fun, it was kind of light on the deeper story elements that have come to mean as much to us as the brothers Winchester. It was about painting a broad stroke across the mythology of America and revealing the hidden nasties lurking there. Here, again, creator Eric Kripke and company were painting that stroke, but they were also adding layers to the narrative that would pay off later. One of the major plot points was the introduction of Harvelle's Roadhouse, which served as a sort of home away from home for the boys on the road. The introduction of the roadhouse aided the development of the secondary cast of characters that would carry the boys emotionally along their journey. We also saw the introduction of other hunters and their community, where the boys were well-known because of their ties to their father, John (Jeffrey Dean Morgan). Most importantly, though, it gave them a sense of belonging. While much of season one had them feeling very much alone, Harvelle's showed them that they weren't. And while they'd been fumbling along, learning as they went, here were people who could teach them tricks of the trade. In a way, it was Sam and Dean almost finding a place of happiness in the middle of their quagmire of misery. And you know how well the Winchesters and happiness go together. Of all the people they allowed into their emotional sphere, the strongest personal presence was Jim Beaver's Bobby Singer, who grew from a curmudgeonly old friend of their dad's to one of the most important emotional connections the boys have. It's a performance and a role Beaver nails perfectly from his first scene. He's become every bit as beloved as Sam and Dean themselves, as evidenced by the recent fan push to have him upgraded to series regular (it didn't happen, but he'll still play an important recurring role). While their main focus for the second season was on the yellow-eyed demon Azazel (Fredric Lehne) that killed their mother, we still had plenty of time to get Kripke and his team's unique take on lots of other American legends and folklore. As revealed on "The Devil's Road Map," there is a kernel of true lore at the heart of every episode, and then each of them is carefully tweaked to give us that Supernatural twist. You may see ghosts, demons, zombies, and even vampires on Supernatural, but you're not going to recognize them from anyplace else. It's a dark and twisted world they're creating, and even though it's populated with familiar-sounding baddies, it's wholly original. None of this would work, though, without the presence and skill of leads Jarad Padalecki and Jensen Ackles. They proved themselves from the beginning of the series, but the second season challenges them and shows new facets and sides to their characters' personalities. In fact, Eric Kripke himself said that it was Jared Padalecki's strength at playing a demon-possessed version of himself that helped the writers push Sam into that darker territory that nearly consumes him by the end of the fifth season. While the current seasons of Supernatural may seem hopelessly complex for new people to jump into, Season Two is probably the best jumping on point. The first season lacks a real sense of focus and direction, but it was here that the creators decided to start building their larger story, without totally abandoning the episodic stories that drove much of their early success. Even today, Supernatural is as known for their fun one-off episodes as they are for their larger arc pieces. I would say they've mastered a better long-term balance of these two (including actual payoffs to longer stories) than The X-Files was ever able to manage. The Blu-ray set is rounded out by a lot of familiar featurettes to those who may have the DVD set. We get three little featurettes that take you behind the scenes of the special effects, the props, and the writer's process, but only the latter is really worth the time. The deleted scenes are mostly inconsequential. More fun is Jared Padalecki's early screen test for the role of Sam. Spoiler alert: he pretty much had the character envisioned perfectly when he walked in. Three episodes feature solid audio commentaries. Executive producer/director Kim Manners, producer Cyrus Yavneh, Padalecki, and Ackles talk on the season premiere, featuring Dean as a ghost. Kripke flies solo on his alternate reality foray, "What Is and What Should Never Be," and he's joined by executive producer/director Robert Singer and executive producer/writer Sera Gamble for the commentary on the epic season finale which leaves your heart in your throat and will have you scrambling for Season Three.